This is a very creative crafts project for children who want to make their very own doll house. It turns out great and it is made out of cardboard boxes. We will also show you how to make cool cardboard furniture for your house. This two-story doll’s house is extraordinarily easy to make. It takes shape quickly and yet it is so sturdy that you will be playing with it for months. You will have great fun furnishing the rooms with the simple but real-looking furniture. This two-story doll’s house is extraordinarily easy to make. It takes shape quickly and yet it is so sturdy that you will be playing with it for months. You will have great fun furnishing the rooms with the simple but real-looking furniture. Seal one carton closed on all sides with Scotch tape or whatever kind of sealing tape you have. 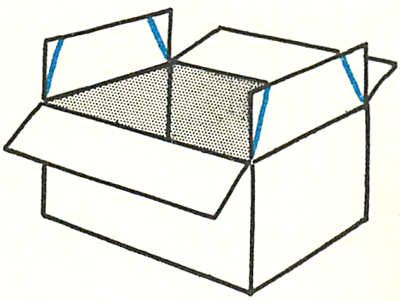 Turn the box, so that the largest sides form the ceiling and floor. 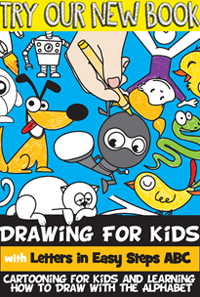 On one of the larger of the four walls, draw a box about 1/2 inch in from the edges, with your pencil and ruler. 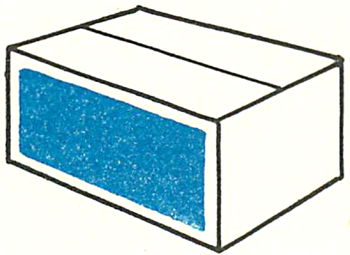 This box is shown by the solid colored lines in the picture above. If your parents are helping, have them use a knife to cut along these lines….if not, try using a scissor to cut the cardboard. Push out the piece of cardboard and save it for further use. The picture above shows the colored part, which is removed. You will now be able to reach into the inside of the box. Cut away the two small flaps which are on the floor of the box. Leave the ceiling flaps as they are, but lay a few strips of gummed paper or scotch tape across the ceiling to keep the flaps from falling down. 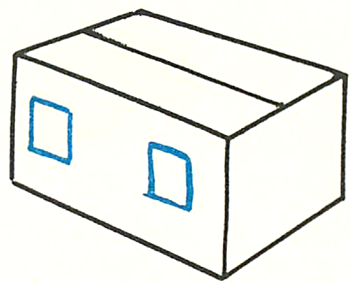 Now draw two small squares on the back wall—the wall opposite the cut-out side—for windows, as shown by the colored lines in the picture above. Cut these out. The ground floor of your house is now completed. Put it aside for the time being. Here’s how you make the second story: Seal only one side of the second box. The sealed side will be the floor of the second story. The open side will form the roof. 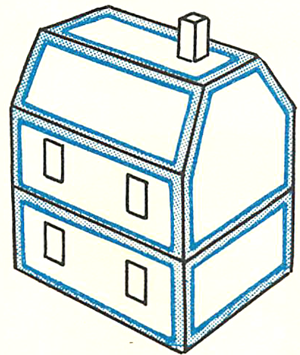 In order to make a slanting roof, draw two lines on each of the small flaps, as shown by the colored lines in. Cut along these lines. Now stand the four flaps up and make them meet. 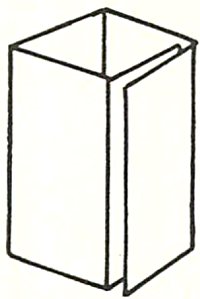 The two long flaps will slant in and meet the slanted edges of the two smaller flaps, as you can see in the picture above. Seal the four flaps together where they meet. The top of the roof will still be open. Now take this box and cut the front wall and the windows in exactly the same way as you did with the first box. The windows of this second story should be directly above the windows of the first story. Before you close the opening in the roof, make the chimney out of one of the cut-out pieces of cardboard that you have saved. Cut it to about 5 by 10 inches. Then, with ruler and pencil, divide it into five equal parts, as shown by the colored lines in the picture above. Run your scissor lightly along these lines. Do not cut through the cardboard. Now you will be able to bend the cardboard neatly along these lines. The picture above shows you how to lay and paste the open flaps over each other. Now take the other piece of cardboard you have saved from one of the cut-out walls. Cut it to exactly the same size as the opening in the roof. Then cut a hole in it for the chimney, as you see in the picture above. Be careful not to cut this hole too large. It’s better if it’s a bit smaller than the chimney, for if you have to force the chimney into this hole, the chimney will stand upright. The picture above shows the chimney in place. 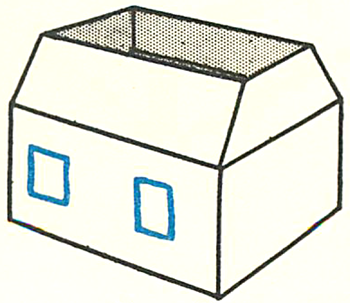 It also shows how you then place the top of the roof over the opening. Seal this rooftop in place with gummed paper. 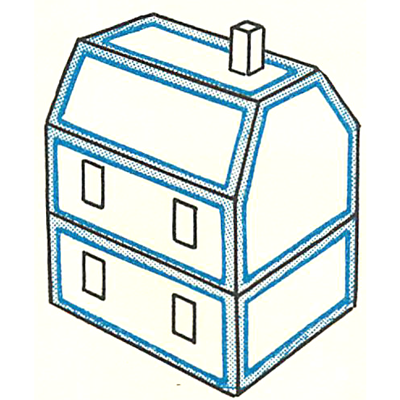 The picture above also illustrates how you place one carton on top of the other with the windows of each story directly above each other. You attach the two stories together by pushing paper clips through the floor and ceiling. thanks for give me a new lesson. I want to teach this for my students.